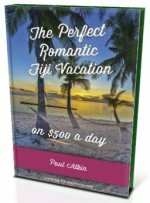 Want to know about the economy of Fiji? Find out here. You won't be surpised to find out how important tourism is to this exotic set of islands. Historically, sugar has been Fiji's greatest money maker with a concentration of sugar being found on the northern and western coasts of the two big islands of Viti Levu and Vanua Levu. 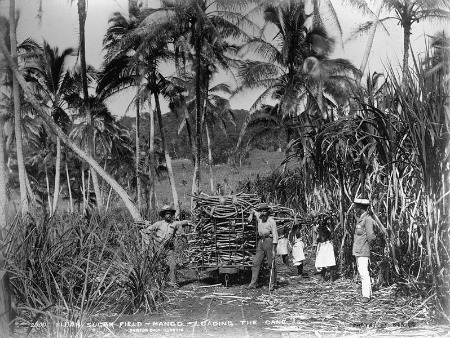 There are 4 sugar mills in Lautoka (once being the biggest in the southern hemisphere), Ba, Rakiraki, and one in Labasa on Vanua Levu. Sugar makes up of about one third of industry activity. Fiji is endowed with fish, forest, and mineral resources. Agriculture is a big part as it employs around 70% of the workforce as of 2001. Other significant crops include copra, ginger, and coconuts. Sugar exports and tourism are the 2 major sources of foreign exchange. Tourism became significant rapidly expanding from the early 1980's. It's a big part of Fiji's economy and is vital, often the only source of revenue, for many islands and communities. Aussies account for around a quarter of visitors followed by New Zealand, U.S.A., Japan, and U.K..
Tourism is the modern cash-cow with resort-based tourism and with large ocean liners stopping through. Foodstuffs, machinery, mineral fuels, beverages, tobacco, and manufactured goods are the principal imports. 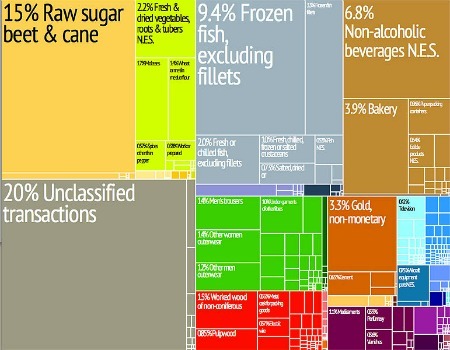 The two largest exports are sugar and garments followed by fish, lumber, molasses, coconut oil and ginger. Even though natural disasters have affected the economy, the drought in 1998 and the cyclone in 2003 to name a couple, the coups have compounded Fiji's economic woes. From 1987 to 2006, Fiji experienced 4 coups which resulted in negative ripple effects to the economy of Fiji. Tourism sharply declined in the aftermath of certain coups. Foreign aid stopping coming in as foreign governments voiced their disapproval of how the coups went down. And international companies pulled out of Fiji as a result, with the Rip Curl and Billabong international textile manufacturers closing down their large factories on Viti Levu. After the coups, Fiji has experienced an alarming rate of emigration. Some 70,000, around 10% of the total population, left in lieu of the coups with 90% being Indo-Fijian (Fiji Indian). Sometimes termed the brain drain, it was found over 60% were skilled workers. Remittances from Fijian expats living overseas have been increasingly relied on by local communities. Personal remittances have now increased to over FJ$200 million a year, earning more than traditional industries like sugar and garments.